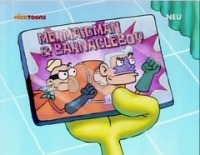 Mermaid Man and Barnacle Boy Fridge Magnet – From SpongePedia, the biggest SpongeBob-wiki in the world! The Mermaid Man and Barnacle Boy Fridge Magnet just appears in the episode The Cent of Money. It belongs to SpongeBob. In The Cent of Money, Gary accidentally swallows it and gets alot of change for Mr. Krabs. It was also an item available at the SpongeBob 2010 Atlanta convention. This page was last modified on 11 December 2011, at 20:23.